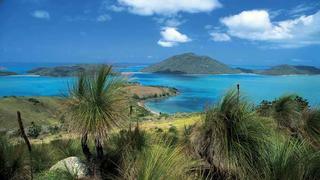 The Whitsundays are continental islands: the peaks of what was originally a mainland mountain range. Its valleys were flooded by geological events at the end of the Ice Age around 10,00 years ago and as a result became separated from the coastline by an expanse of sea. The largest and most spectacular island in the group, Whitsunday Island, is less than 2 kilometres to the north of Hamilton Island. This undulating landmass covers more than 250 square kilometres, has a heavily indented shoreline in may places, and provides some of the most spectacular natural features to be found  translucent and protected tropical waters, a vibrant, green, low profile forest, the towering 407-metre high granite face of Whitsunday Peak and the most famous of them all  Whitehaven Beach. Recognised as one of the worlds 10 best beaches, Whitehaven is a breathtaking seven-kilometre strip of fine, sun-bleached sand that forms a gentle arc bending from the southeast tip of Whitsunday Island to the north. By boat the most memorable arrival is from the south. After negotiating the impressive tidal swirls that are an exciting feature of Solway Pass, the amazing spectacle that is Whitehaven Beach begins to unfold at an accelerating pace on your port bow. You can only be amazed by the sheer length and brilliance of this ribbon of soft deserted sand, the powerful lushness of the dense green forest that lies behind it, the inviting nature of the translucent, light blue water, and the dominant topography of Whitsunday Island. Alternatively, there is the aerial approach via helicopter or seaplane  a spectacular and memorable flight above this remarkably close-knit chain of primarily uninhabited islands. 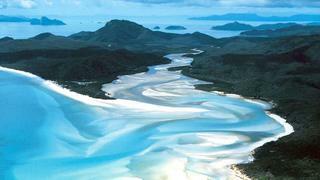 Even today, it is not unusual to have much, if not all of Whitehaven beach virtually to yourself. While tourist and charter vessels are regular arrivals at this amazing destination, it is not a struggle to find your own isolated spot where you can relax on the sand or swim in the pleasantly warm water. 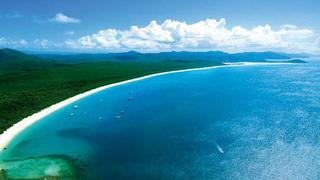 Beyond its high international acclaim, Whitehaven is also recognised as Queenslands Most Beautiful Beach. It is unique in the world because its unspoiled white sands have been declared by scientists to be just a fraction short of pure silica. The sand is powder-like grains of quartz so pure that it is ideal for manufacturing the finest glass optical lenses for binoculars. The origin of this sand is not known, however some geologists suggest it has reached this part of the world through current drift systems that bring sand from the south, purifying it as it goes. At the northern end of Whitehaven beach is Hill Inlet, a shallow cove that winds its way inland for more then five kilometres (three miles). Here the same white silica sands are forever shifting in swirling patterns as the tide floods and ebbs. It is a feature best appreciated either from the air or from the lookout on the top of Tongue Point, the northern headland at the entrance to Hill Inlet. With the southeast tradewind being the prevailing breeze for much of the year in the Whitsundays, it is Cid Harbour on the western side of Whitsunday Island that provides some of the best shelter, and here Sawmill Beach is a special destination. It is one of the most historic locations in the Whitsundays: in 1866 James Withnall and Martin Cunningham established a logging camp and subsequently a sawmill there and logged the hills of the island. During World War II the Whitsunday Passage became an important part of the east coast route for warships, and Cid Harbour, because of its deep and sheltered waters, became a designated naval anchorage for a considerable number of Australian, American and British warships, many of which sought refuge there in the period leading up to and during the Battle of the Coral Sea. Sawmill Beach also has many waterfalls and cascades along its shore. This year Hayman Island, which for many years was the only five-star resort in the region, has been undergoing a major upgrade. It is the northern-most island on the eastern side of the Whitsunday Passage and has a resort history dating back to 1931. Hayman, which had been modelled on the Royal Hawaiian Hotel in Honolulu, was then Australias most fashionable resort. Whereas in the early days it was serviced by seaplane and ferry, in later years helicopters flew guests in from the mainland. Today, the majority of Haymans guests fly into Hamilton Island and are transferred by high-speed boat to the island. Reg Ansett did a double deal when he bought Hayman, as the package included Lindeman Island, which is located immediately south of Hamilton Island. Like Hayman, this island leapt into life as a tropical holiday destination immediately after the war, its appeal being enhanced with a 600-metre (2,000-foot) long grass airstrip that was established across the top of the island. This allowed Tiger Moth biplanes and other light aircraft to reach the island directly from the mainland with guests on board. In recent times Lindeman has become part of the international Club Med resort organisation. The island has a links-style nine-hole golf course and also offers guests numerous bushwalking tracks, the most interesting of which passes through a valley that teems with butterflies. Another track winds its way to the islands summit, Mount Oldfield. One special destination is the beach at Blue Pearl Bay, on the western side of Hayman Island. It is an extremely popular place for divers and those wanting to snorkel as it has abundant sea life and many forms of colourful coral close to shore. Daydream Island, on the western side of the Whitsunday Passage, is the island resort closest to the mainland. It is just four kilometres (two-and-a-half miles) off Shute Harbour, which is the departure point for island and Great Barrier Reef tourist boat services. 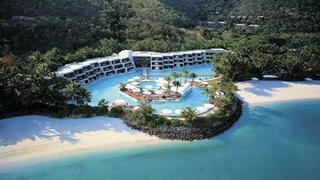 Today it is called Daydream Island Resort and Spa and offers 296 rooms. 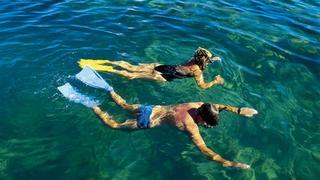 As with the majority of Whitsunday Island resorts, it caters primarily for families and offers a wide range of water and on-land activities. The uninhabited Shaw Island, which is to the south of Hamilton Island, is another destination of desire. It has many beautiful bays and beaches, and its shape sees it provide protection in all wind conditions. To the east of Whitehaven Beach is a similarly beautiful beach on Haselwood island, which boasts a small coral reef ready to be explored by snorkellers. With there being so many reefs forming part of many of the islands it is inevitable that the majority of the beaches in the Whitsundays are formed from pulverised coral. Even so, these beaches, while not being comparable with Whitehaven, are usually sheltered and secluded. The majority of them are found deep inside the myriad coves and bays on the generally heavily indented shorelines of the islands.